An amazing and different musical experience! An accordion is a hand held musical instrument which makes music by squeezing bellows and forcing air out through a reed. It is often heard in Eastern European folk music. Give your child a cultural as well as a musical experience with the accordion! Learn the basics of Accordion. You'll see that it is amazingly fun and not that difficult if your kids start young. Let give them a try! Is playing theAccordion a great activity for your kid(s)? Portable and light – great for anyone who doesn't have space in their house for a grand piano! Teaches musical appreciation and understanding – learning to read music is a useful skill which can help kids in the future if they want to branch out and try a different musical instrument. Helps kids with their co-ordination – playing the accordion requires kids to push, pull and manipulate the keyboard at the same time as reading the sheet music. This can help with focus and multitasking skills. Not sure what age you should start your child? Around age 6 is usually considered a good age to start your child in a music class as they will probably have developed the co-ordination and strength to play properly. Get your kid to start learning the Accordion! No accordion teacher or class in your area? 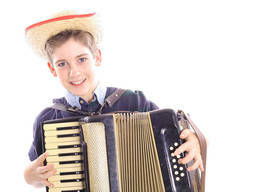 If your kid is really keen to learn the accordion, another option is to buy an accordion and take an online course. Online courses are generally much cheaper than tuition and your child can learn about technique, tone, musical theory and other useful information to get them playing. There are a number of different types of accordion’s including piano accordion, bass accordion and button accordion. It's important when choosing an instrument for your child that it is an appropriate size and shape and they are comfortable using it. If your child is looking for music based kids' activities that can help them stand out from the crowd, give the accordion a try!